A.H.R. Florals is partnered with Vin de Syrah for a course in keepin' fresh & pretty. Learn the in's & out's of floral design and walk away with your very own glorious creation. Ticket includes all supplies, tools, & class. Description: Bring out your inner springtime goddess with en concordia & AHR Florals. Learn the in's & out's of floral design and walk away with your very own glorious creation (perfect piece for music festival season). Ticket includes all tools, supplies, fresh flowers and choice of mimosas or refreshing hot tea. Learn the in’s & out’s of winter floral design and walk away with a new skill, a new love, and a new glorious creation made by YOU! Come in and play with all the wintery floral goodies AHR Florals has to offer and walk away with your very own gorgeous holiday wreath. Design a beautiful table arrangement for your Thanksgiving table! This class is so much fun to do with friends before the holidays! Take a break from the holiday hustle and make something beautiful together! *This class may be requested for private parties + corporate events. PINOT+PETALS: A Night of Wine & Floral Design, Flower Crowns! The best gift to give a mother is spending time with her! Spice up this mother's day with a night of wine & floral design! A.H.R. Florals is partnered with Mint Studios for a course in keepin' fresh & pretty. Learn the in's & out's of floral design and walk away with your very own glorious creation. Ticket includes all supplies, tools, & class. When: Saturday, March 10, 10 a.m. – 12:30 p.m.
PINOT+PETALS: A Night of Wine and Floral Design, Flower Crowns! Wine, music, jewelry, desserts, flower crown bar, & a live floral wall. Come join us for a Galentine's Party with waffles & mimosas! Swag for first 50 gals! Bring your favorite gals to celebrate your friendship! A.H.R. Florals is partnered with Curators & Creators Marketplace for a course in keepin' it holiday fresh. 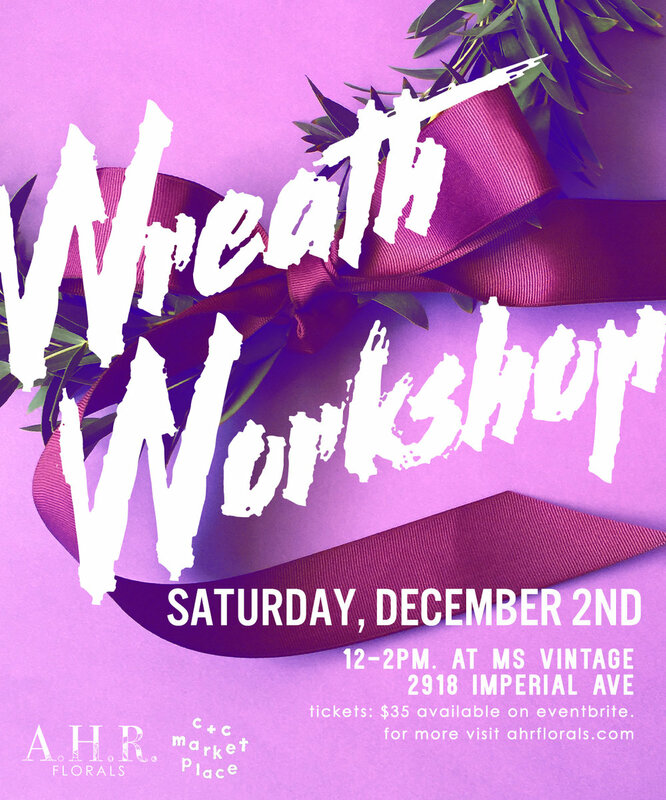 Learn the in's & out's of wreath design and walk away with your very own glorious creation. A.H.R. Florals is partnered with Mint Studios SD for a course in keepin' fresh & pretty. Learn the in's & out's of floral design and walk away with your very own glorious creation. Ticket includes flowers, supplies, vase. A.H.R. Florals is partnered with Machete Beer House for a course in keepin' fresh & pretty. Whether it's for holloween, Dia de los Muertos, or your own damn self, learn to make your own fresh flower crown and sip on crisp beer from the best local breweries. Ticket includes class, supplies, & first beer.